Who knew? 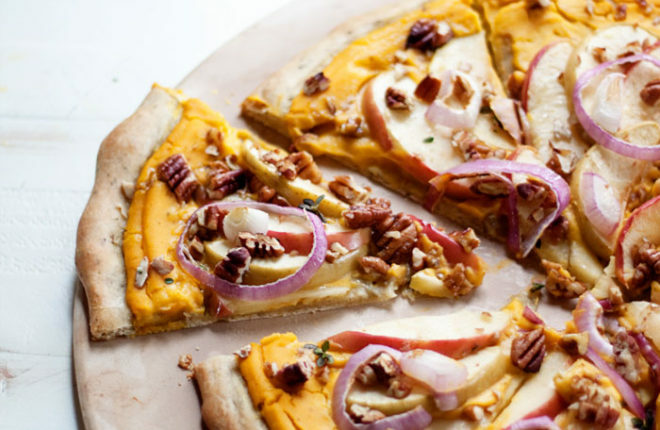 Butternut squash makes a silky-smooth and full-flavored pizza sauce, and the perfectly creamy base for this fall-inspired pie. Scrumptious as is, but you can also make individual size pizzas and add gouda or mozzarella for the cheese-eaters and cooked, crumbled sausage for the carnivores. Win! This is one I’ve been dreaming of for awhile. I had an inkling that butternut squash would make a creamy, dreamy pizza sauce – after all, it’s divine in this mac and “cheese” – and I was eagerly waiting until fall came and I could try it. Finally, the time came, and I made the sauce and … I could not for the life of me decide what else to put on it. So, the first time I made this, I smeared my pizza crust with the delicious sauce and then, not sure what else to do, I threw on a few slices of onion and called it good. The result was surprisingly delicious, but as soon as I took a bite, I knew that apples needed to happen on this. And pecans weren’t far behind. Not to pull out the “you guys,” but seriously. You guys. 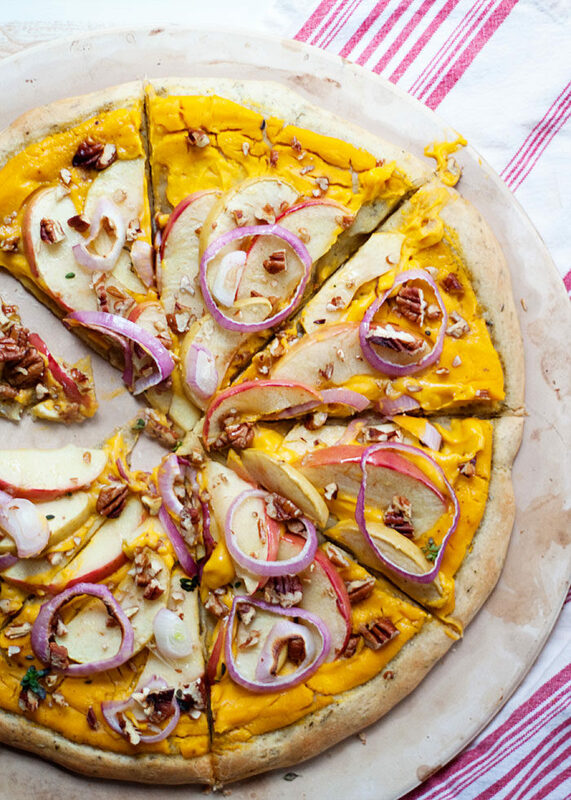 This is such a great autumn pizza. As I mentioned here, vegan pizza really doesn’t have to be that sad cheeseless disk that you might envision. As long as you have a good crust, great flavors, and an element of creamy, you’re good to go. 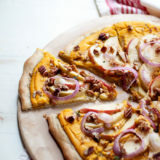 The butternut squash pizza sauce definitely fills the “creamy” criteria; the rest is all flavor. As always, this recipe is entirely customizable for the lacto- or meat-inclined. Make smaller, individual pizzas and just add cheese for the dairy-eaters (I added mozzarella; gouda would likely be unreal). As far as the meat-eaters go, a bit of cooked and crumbled sausage should make them very happy. Make the sauce. Fill a large saucepan halfway full of water and set over high heat. Add butternut squash. Bring to a boil and cook until fork-tender, 6-7 minutes. Drain squash in a colander and let cool for a couple of minutes. Add to the pitcher of a high-speed blender or the bowl of a food processor fitted with the S-blade. Add the remaining ingredients and puree until smooth. If the sauce needs to be thinned out a bit, add some more olive oil, about a teaspoon at a time. Spread the dough into your desired shape and thickness on a cookie sheet or pizza stone. Add butternut squash sauce and spread with a spoon. Layer with apples, then onions, then pecans. Drizzle with 2 tablespoons olive oil and sprinkle a couple pinches of salt over the top. Bake until the crust is golden and cooked through, the apples and onion are tender, and the pecans are toasted but not burned, about 10 minutes. Top with fresh thyme if desired. Cut into wedges and serve. Add some shredded mozzarella cheese to all or part of the pizza before baking. Add some cooked and crumbled sausage to the pizza before baking. I’ve started to play more with butternut squash as well, and I’ve been so surprised by how versatile it is. 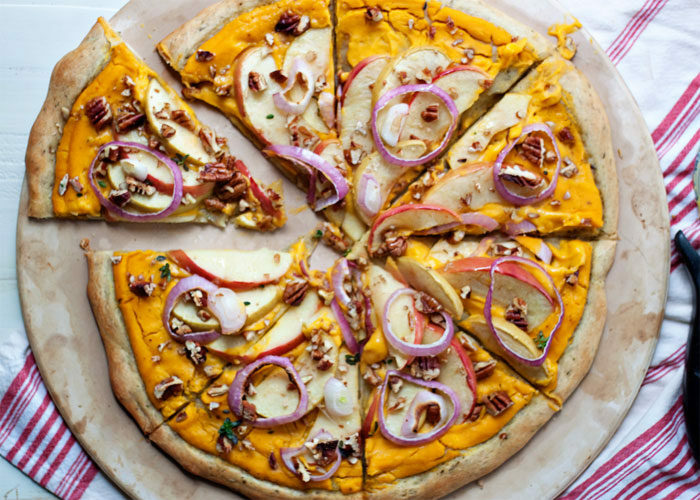 What a great idea to use it to make a creamy base for a pizza! 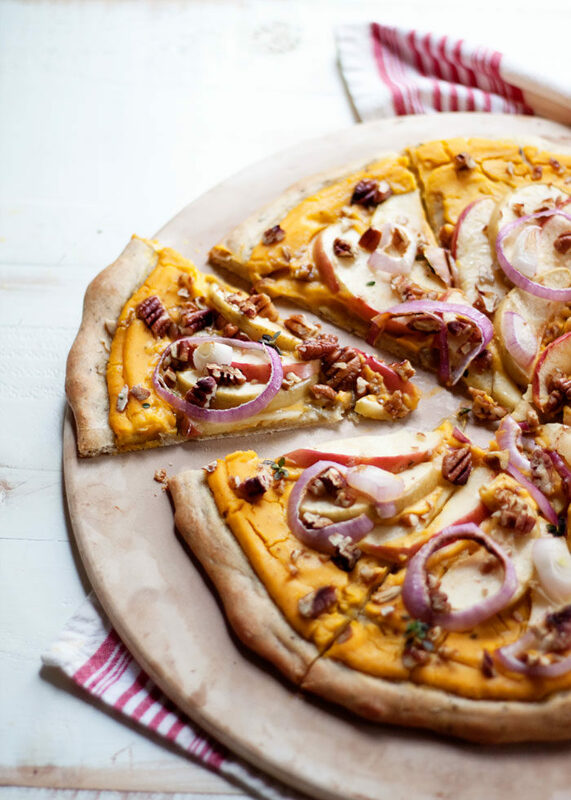 The apple and pecan toppings sound splendid with the squash! The pizza looks so colorful, and tastes as yumm, good one, thanks for sharing the recipe! I love pizza very much, but now I’m on a diet. This pizza is really good for me. It looks so healthy. 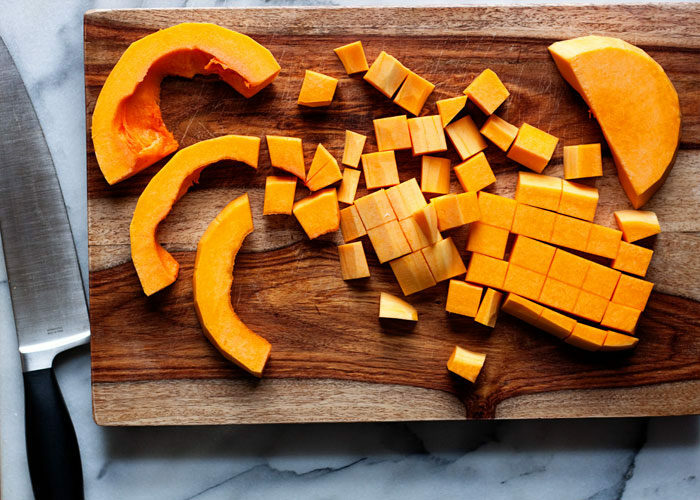 great use for butternut squash! i think id rather eat this than regular pizza!! yum!